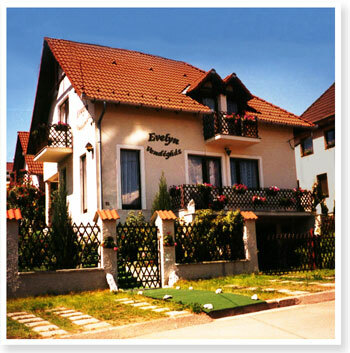 The Evelyn Bed & Breakfast is located in the peaceful and green area of Eger, only a walking distance from the historic city centre. Each room is equipped with a shower, satellite TV, radio and mini bar. Free Internet is available for our customers at their convenience. Parking spaces are also available. Our guests can enjoy the quiet and intimate garden and terrace to read a book or have a rest in the sun. With its cosy atmosphere, our Bed & Breakfast will make your stay in Eger unforgettable. Be tempted by a parenthesis of serenity and take this opportunity to visit Eger, the most beautiful baroque city of Hungary, home of the “Egri Bikavér” and of a great number of thermal baths. We hope to welcome you soon in our friendly little Bed & Breakfast!